Heads up, Gold Line riders. 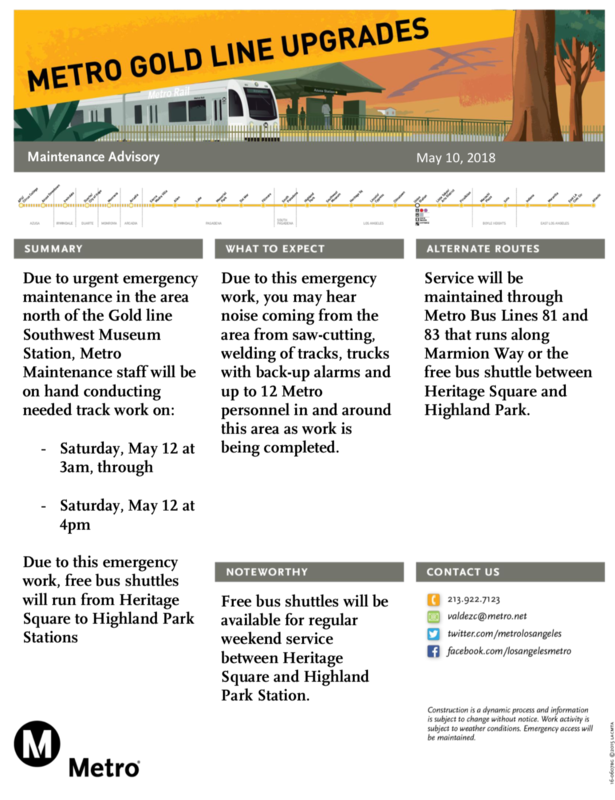 There will be no Gold Line service between Heritage Square and Highland Park this Saturday, May 12 from start of service to 4 p.m. During the closure, crews will perform track maintenance work near Southwest Museum. Free bus shuttles will replace trains between Heritage Square and Highland Park Stations throughout the closure. This means all southbound trains will travel as far as Highland Park and turn back to Azusa. The last stop for all northbound trains will be Heritage Square Station. From there, trains return to East L.A. The Gold Line is scheduled to run every 12 minutes while work is in progress and shuttles will match train service as best as possible. Please allow extra travel time to transfer between the train and bus shuttles. Metro personnel will be at the affected stations to lend assistance. Regular train service will resume after 4 p.m. on Saturday. Get a free 1-year Metro Bike Hub membership during Bike Month! Isn’t the Gold Line well traveled on Saturdays? Why not get this work done in the night hours? You would need fewer busses. The work could be down over the course of 2 or more nights, if needed. Customer service, think about it. I agree. You guys do way too much maintenance during the day. Do maintenance work from 10pm to 5am on every line and every night if you want. Stop doing maintenance during the day! There are constant notices that the Gold Line will be undergoing maintenance from 9:30am to 2:30pm it seems like daily – do it at night!!!!!!! Okay, I’m sorry, but what was the point of reducing service to 20 min every night and actually not take advantage of that lowered frequency by doing maintainance during the evening. Metro is Promoting 12 min frequency on the Gold Line during the day, yet that promise is not only being kept, but Metro doesn’t even give itself a deadline or at the very least, a timeline of when these mid-day delays will end, without even an explanation as to why.